Lately I’ve been thinking a lot about how I can find my voice. Or better, how I can refine and clarify my voice. Because obviously I already have a voice. If you think about it, especially if you are a blogger or express yourself otherwise publicly, you also already have a voice. The question is: What is your voice singing? And is it heard? And if you are focusing on your local community and family, you also express your inner voice and by that you influence the people around you. Finding Your voice is an absolute worthwhile undertaking, because without it you simply won’t get noticed. You can also call it being unique or being remarkable. 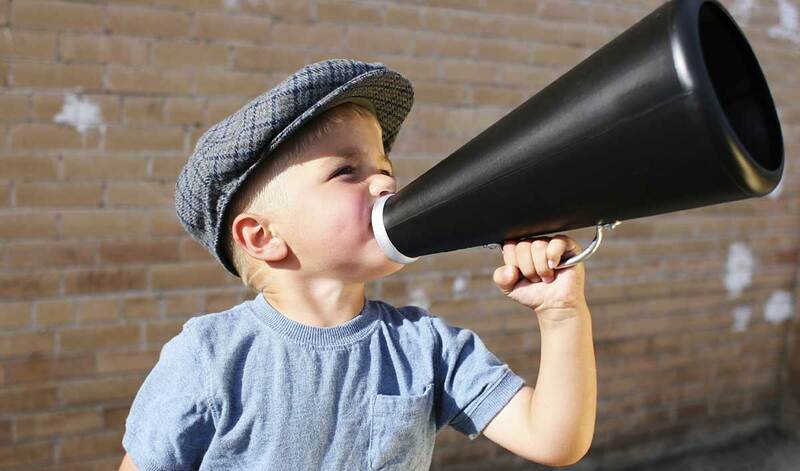 The point is: wether you are a blogger, a movie-director, an entrepreneur, a writer, a parent or grandparent, a child, an anyone… without talking from your voice, nobody will listen. Your voice is your authentic self speaking. Your identity expressing itself. It is your personal and individual message to the world. It is something that wants to get out of you. It’s the feeling that you would not have fully lived, without letting the world know. Your voice is in fact, your contribution to mankind. It is also hopefully about something that you are passionate about. If you don’t really like it, you won’t feel that it’s part of your identity. You must be reasonable good at what you are saying. This can mean a lot of things. Maybe you are inspirational, maybe you are really skilled or have a lot of knowledge to share. But it must have some kind of quality to it. It would be best if your voice is creative, inspiring and engaging people or even innovative. And third, your voice must be something other people care about. It must be beneficial and interesting for other people to hear your voice. 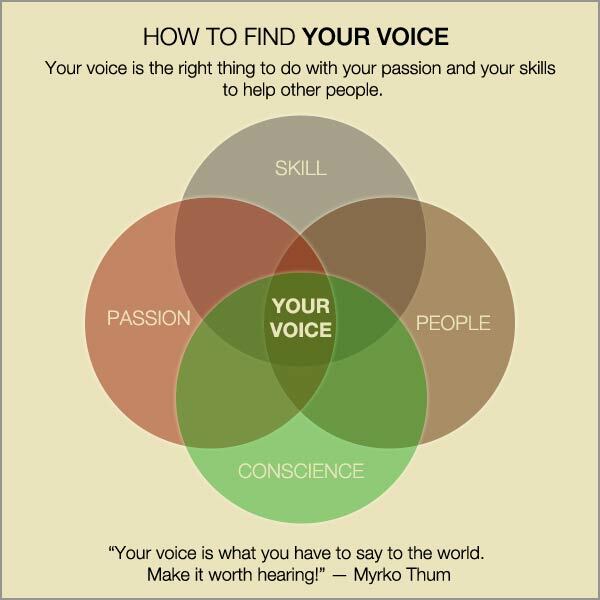 At the nexus of your greatest passion, your best skills and where you make people listen, you will find your voice. There is also a fourth component to complete the definition of your voice. That component is called: conscience. Conscience was especially introduced by Stephen Covey in his follow-up book to the 7 Habits, which was called The 8th Habit. Conscience is the guiding inner voice that tells us what is right and what is wrong. What I mean by that is that from my perspective and experience, while I have a general idea for my voice, it also just takes time to refine and shape what I would finally call my voice. This article here alone is a process of self-reflection to refine my own voice. I also need some experience and also feedback from you, my readers, to refine the way I can really meet your needs to the best of my abilities. What did I do best? What did my followers loved the most? What new input did I get? And how can I use this to shape my voice further? This feedback and my inner dialogue help me to strengthen my own voice. I think this is a healthy and natural approach of continuous improvement of what you share with the world. Maybe you also come from a realm of simply knowing your voice. You could say that this is Your Calling. Intuitively you have this inner feeling what you have to express and share with others. It all comes from the inside. Stop comparing yourself to others and use self-reflection to get connected with your inner voice – with what your conscience tells you. I believe that certain books like The Power of Now are produced in that way. The author did not do much research or asked what the market wants, it just came out of him naturally. Eckhart Tolle said that more than once: “There was a book inside of me that wanted to be written”. He doesn’t even think about his voice, it’s just there – maybe because it doesn’t get distorted. This may not work for everyone, but if you feel no resistance inside and you have this strong sense that this is your calling, then this may be exactly your voice asking to express itself. Go for it! The final way to find your voice is to define it. 1) What are your greatest passions? What do you love to do? 2) What are your skills and talents? What do you do best? 3) Think about how that could benefit other people. How did you create value for others? 4) Is this the right thing to do? Does it fulfill you with meaning? Is your conscience giving you green light? Look at the picture we had above. At the nexus of these 3+1, if you answer all 4 questions, you will find your voice. So, What is Your Voice? Take a moment and think about it. Define your voice by reflecting on your passion, skills and where you can connect with people. Then write it into the comments below! Great, you’re most welcome Dorcas Apio! Mihaela, thanks for this really great comment. The seeking for our voice brings us to face our fears, and our limits we think are reality. We really get to know ourself, discover new depths of what moves us. I think this is beautiful and the essence of personal development. Keep looking and have the courage to express your voice. It’s liberating and you’ll notice how many people are thankful for just being the real you! I just found your site while searching for zen koans, but this post about finding one’s voice is very timely for me. I have been on a personal development and meaning seeking journey since I was 6 – first time when I remember asking myself what was my life about. Like you, I struggled with depression on and off and could finally tame it and get free. I spend years reading every book on life calling and finding my voice (hint on what my passion is :-)). This past December I started a coaching practice for divorced moms (why? b/ I’m divorced…) and felt like I’m walking on eggshells since then, because even though I called it divorcedmomszen.com – so the “zen” was there, I was so tentative in expressing the spiritual part of myself, as well as my creative/poetic side. I just realized that my “voice” barely comes through this business I created and that there is so much fear and holding back in fully expressing myself. Your post and your life (as a role model) helps me “accept” my passion which is and has always been in the personal development, no matter the gender of the person (not just moms) and no matter the event that provokes it. Also accept the joy that comes from being with people that realize that “the only journey is the journey within” like Rainer Maria Rilke said. Accept that all this is not fluff, that if I could overcome depression, a hard divorce, a dramatic career change (well, in progress) and be happy almost every moment – then this is who I am and this is worth so much more than any scientific talk, than any hard-core math proof…It is proof that personal development works – like it worked for you and for many others, and that I should not be ashamed of living a life that so many people would love to call their own.